According to the story, her family found her several days later, her eyes sealed shut and encrusted with a thick layer of dirt and dust. She later said she experienced her first vision during the days she was missing, and believed she had been given the ability to heal people and predict the future. Quickly attracting a cult following, she was visited by Bulgarian tsar Boris III during the Second World War. This established her as a high-level advisor to the highest of government officials and celebrities. She later served as an adviser to the Bulgarian Communist Party leaders, some of whom allegedly exploited her to further their own agendas; the house where she worked was reportedly bugged, and there is some suggestion she may have been manipulated to give suggestions to visiting politicians. 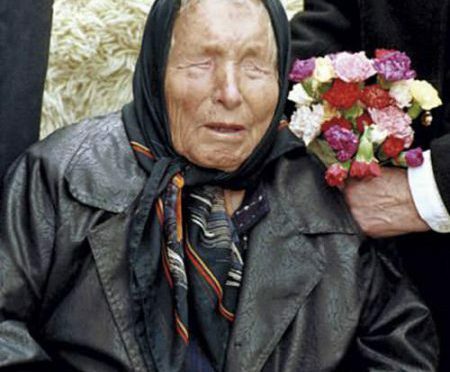 Baba Vanga reportedly made hundreds of predictions in her 50-year career, becoming known as the “Nostradamus of the Balkans.” She claimed that her abilities had something to do with the presence of invisible creatures she could not fully explain or describe to others, and that they gave her information about people. Another of the hundreds of predictions credited to Baba Vanga was that of a “great Muslim war” which would start with the Arab Spring in 2010. However, many of the people who were close to her have claimed she never made some of the prophecies attributed to her on the internet. Though her followers are still legion, it’s difficult to determine the origin of these scarily accurate predictions — where Vanga made them, or if she even made them at all. It’s possible that Baba Vanga spoke or wrote down her prophecies in Bulgarian, and they’ve never been credibly translated into English, except when deemed applicable or suitable by unknown sources. The Washington Post has suggested that Russian social media and “conspiracy theory websites” might be behind the more scarily accurate predictions, but then again it’s a conspiracy theory all its own to ascribe Vanga’s predictions to such a source. Although she is said to have correctly predicted the 44th President of the United States would be African-American, she also stated he would be the “last US President”. She also predicted nuclear war between 2010 and 2016, which she said would lead to the abandonment of Europe, that aliens would help civilization live underwater by 2130, and that there would be a war on Mars in 3005. Whatever your level of belief, there are undeniable similarities with real-life events, as well as drastic deviations from what has come to pass. Just as with any prophet. The truth lies in your belief.